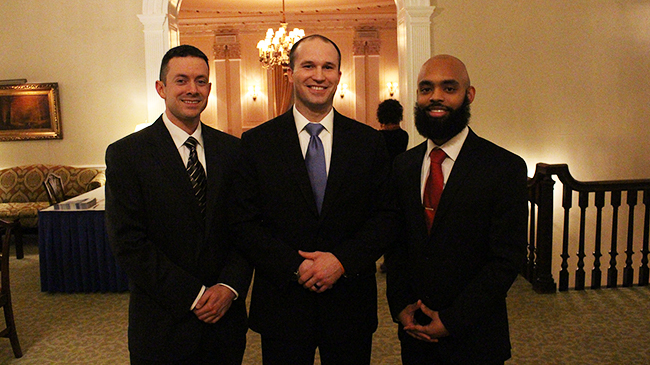 IU Southeast MBA students (l-r) Steven Perkins, Clayton Owsley and Roderick “R.J.” Sherman earned second place at the annual CFA Research Challenge at the Pendennis Club in Louisville, Ky.
(NEW ALBANY, Ind. )—Last week MBA students Steven Perkins, Clayton Owsley and Roderick “R.J.” Sherman represented IU Southeast at the annual CFA Research Challenge regionals in Louisville, Ky., taking home second place in a virtual photo-finish. The CFA Research Challenge is an annual event organized by the CFA Institute, a global association of investment professionals that sets the standard for excellence in the industry for chartered financial analysts (CFAs). The Challenge gathers students, investment industry professionals, publicly traded companies, and corporate sponsors together locally, regionally, and globally for a real world competition, according to the Institute website. While winning the world championship is a great honor, the competition is conceived as an educational initiative to build best practices in equity research via hands-on mentoring as well as training in company analysis and presentation skills. Over the course of four months, student teams dissect a corporation and deliver an investment recommendation based on exhaustive research into corporate structure and performance, a site visit and face-to-face interview with corporate representatives, and best valuation practices. In the real world, such recommendations help investors decide whether or not to purchase stock in a company, a decision that can make or lose fortunes for both parties. Competing with IU Southeast at last week’s regionals at the Pendennis Club in Louisville were teams from Bellarmine University, the University of Louisville, Western Kentucky University, Centre College, and the University of Kentucky, the eventual winner, by a nose. IU Southeast was advised by industry mentor James Kapfhammer, Jr., associate equity research analyst at River Road Asset Management in Louisville, Ky.
Kapfhammer read multiple drafts and helped the team distinguish between essential and superfluous information. Through this process, they not only made progress on the presentation, they gained insight into what makes a good analyst. Every analysis culminates in a recommendation to hold, buy or sell stock. Each team chooses a different route to that recommendation, based on its understanding of what aspect of a company is critical to its success, and how that aspect is likely to fare in the future. This year, the finance teams zeroed in on a local—and global—heavyweight: Louisville, Ky.-based Yum! Brands, the fast-food conglomerate that encompasses the popular chains KFC, Taco Bell and Pizza Hut. With 1.5 million employees and over 45,000 restaurants in more than 135 countries, according to the company’s website, Yum! is considered a leader in the sector, and is growing abroad, with some 17,000 restaurants in emerging markets. In keeping with the nature of the challenge, the choice of Yum! differed from the focus companies of previous years, which were rooted in banking, manufacturing and transport. Franchising and a recent spinoff, Yum! China, added unique dimensions to forecasting, according to Elizabeth Reisz, lecturer in finance and faculty advisor. While the other teams recommended that investors buy or hold stock in Yum! Brands, the IU Southeast team found optimism in the company’s current strength justified, but its future growth prospects overstated, and recommended that investors sell. Some of the factors that led them to this conclusion were competition in an increasingly saturated fast-food market, the company’s inattention to growing healthy eating trends, threats from dining apps and other technologies, and continued upward pressure on hourly wages. Based on these and other factors, the team forecast a steady drop in the rate of sales growth for the company beginning in 2018. The team’s deep dive into the inner workings of Yum! Brands began in November when CFA Society announced the company as this year’s focus. Each tackled a different area. They worked separately at first, then came together to begin molding their analysis and presentation. A visit to Yum! Brands headquarters in Louisville was informative. The presentation went through several drafts, each of which was submitted to Kapfhammer for comment and review. The team appreciated his real-world feedback. Meanwhile, behind the scenes, there was another challenge: balancing the intense demands of the competition with jobs, family and the MBA program. “It involved a lot of sacrifice,” Owsley said. Given the immense amount of number crunching in isolation and frequent group meetings, the support of wives and children was essential. So was the ability to jump into the topic whenever the opportunity presented itself. “Sometimes you wait until your kids are asleep and work until midnight, or whenever you have time,” Perkins said. In the end, one of the lessons learned was clearly the sense that “team” is an elastic concept that includes everyone with a stake in their success. “Our families made a huge effort at being flexible for us,” Sherman said. After the written presentation, the IU Southeast team was in fourth place heading into the final presentation round. Here they showed considerable fighting spirit in presenting and then defending their recommendation. In the end, two of the judges scored them in first place and the third had them second by only a point. In reflecting on their overall performance, the teammates wondered what might have been, had they concentrated more on on the view from 50,000 feet than the details. Certainly they grew to appreciate the time and effort required to get behind the bright lights of company forecasts, and to reach the level of understanding required to make a responsible recommendation. In the end, they stuck by their recommendation, and take pride in the courage it took to go against the grain, a sentiment applauded by Kapfhammer. Homepage photo: IU Southeast CFA team members Steven Perkins, Clayton Owsley and Roderick Sherman at the Pendennis Club in Louisville, Ky.